When 16 year old Xander’s older brother Moto left him at Vandenberg Airforce Base he only had one request – don’t leave no matter what. But there was no way he could have known that one day zombies would gather into groups big enough to knock down walls and take out entire buildings full of people. 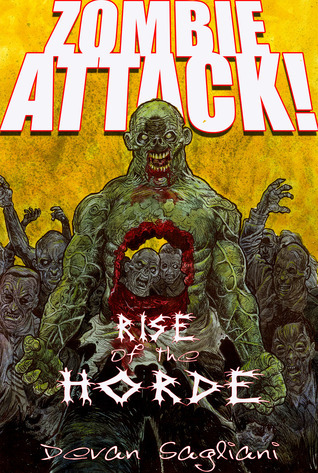 That was before the rise of the horde! Now Xander is on the run, fleeing south to Port Hueneme to locate his brother with nothing but his martial arts training and the katana blade left to him. Along the way he’ll have to fight for his life against other survivors, neo-Nazi’s, outlaw bikers, gang bangers, cannibals, cult members, and a seemingly endless sea of flesh hungry zombies. But Xander is far from alone. Traveling with him are Benji, a 12 year old comic book geek, and Felicity Jane, a childhood celebrity with wild mood swings. Will they make it together in one piece to the safe zone or will they become the next meal for a hungry horde of wild zombies? Zombie Attack! 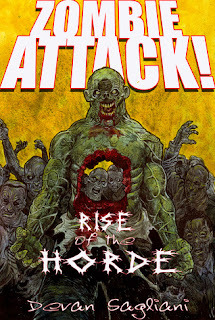 Rise of the Horde is filled with pulse pounding undead action from the very first chapter up until the bitter sweet end. From rock stars and celebrities to false prophets and miracle workers, this book has it all! The story takes off like a bullet and doesn’t slow down until the last sentence. You won’t be able to put it down! I am only about 5% into this book and I am liking what I have read so far. Usually I can tell within the first few pages if the book is for me or not. Devon is a new indie author who is just trying to figure out the crazy book world. I can’t wait to see more from him!! !